I promised to post this recipe after I posted the harissa recipe a few weeks ago. Apologies for my slowness. In the event you still have some eggplant hanging around in the garden or fridge at this late date, here’s a great way to use it. If you don’t have harissa, this is still fantastic on its on. Can easily be scaled up for a larger crowd. 1. It needs a bit of smoke. Don’t be afraid to roast it directly on the gas stovetop (or on a grill). 2. Lay off the tahini. 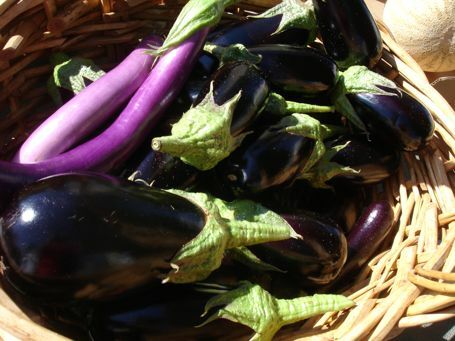 Eggplant has a delicate flavor and too much tahini (most recipes call for too much) will overpower it. 3. See above. I like to roast some of the garlic and leave some raw because I dislike the heat of raw garlic and it overpowers the eggplant. Using a fork, puncture the eggplant in several places. Put the eggplant directly on your gas flame or grill and char it until it is evenly black all over, turning with tongs. 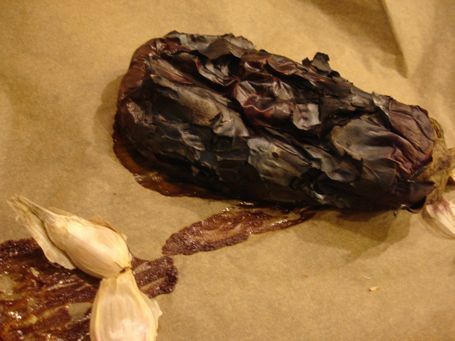 Transfer it to the oven along with the two whole, unpeeled garlic cloves and roast for 10-15 minutes, until the eggplant and garlic are both soft. Meanwhile, assemble the other ingredients. Pound the peeled garlic clove to a paste in a mortar and pestle with a pinch of salt. When the eggplant is cool enough to handle, scoop the flesh off the charred skin directly into a food processor bowl fitted with a steel blade. If there are lots of large seeds remove them as you go, but don’t worry about getting them all. Peel the roasted garlic cloves and add them to the processor with the eggplant. Add the pounded garlic, lemon juice, tahini, parsley, and cumin and pulse until the mixture is smooth. With the motor running, slowly drizzle in the olive oil until it is all incorporated. Season to taste with salt. 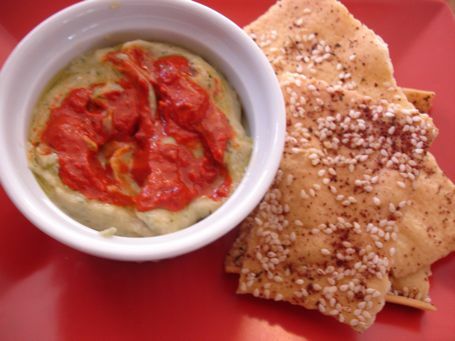 This entry was posted in DIY, entertaining, from the market, healthy and tagged dips, dips and spreads, DIY Baba Ghanoush, DIY Delicious, DIY Harissa, entertaining, harvest, healthy, summer, vegetarian. Bookmark the permalink. Post a comment or leave a trackback: Trackback URL.